I’m really thrilled with the way this project turned out. In a way, it’s a bit of an anti-climax because the Chevron Shirt was more creative design-wise than this shirt, which was largely inspired by a design I saw elsewhere. That doesn’t take anything away from this project, though. 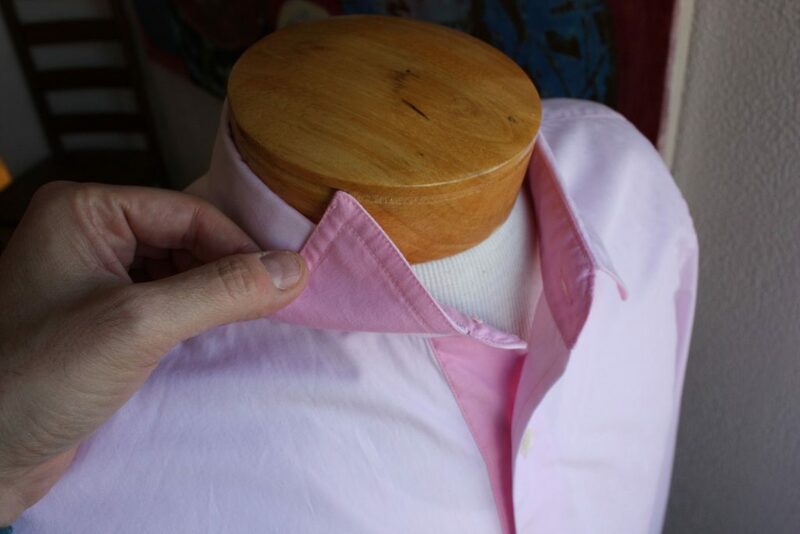 The pink fabric I obtained from Britex Fabrics really makes this shirt. It has just the right amount of saturation, and the pink is more of a bluish undertone than a warmer, peach undertone. But the fabric also has a radiance to it in person that almost makes the shirt seem to glow. 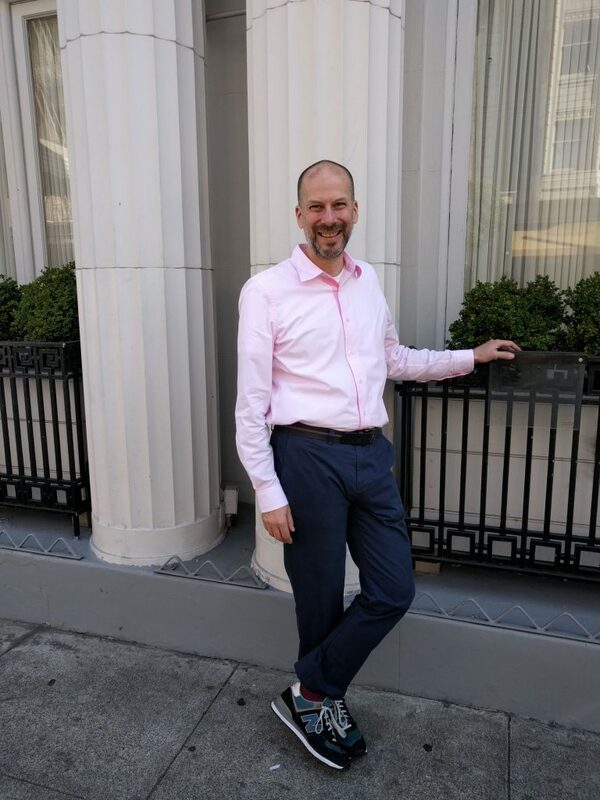 I’ve received several comments this pink looks good on me. I love the way it looks. Here’s some closeups of the shirt. I have given my dress form square shoulders by placing some shoulder pads inside an undershirt, placed over the dress form. 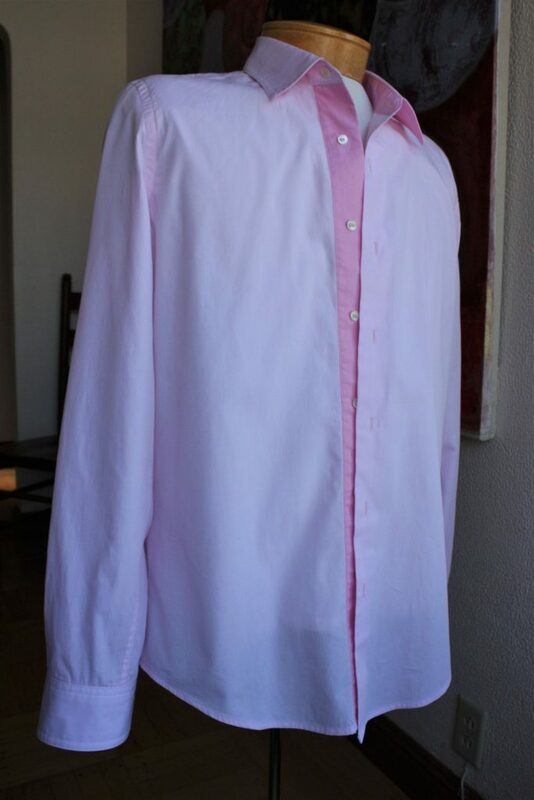 That makes a big improvement in the way my shirts fit on the form. The shirt uses the mother-of-pearl buttons I received as a gift from my friend Linda. I mentioned them in the first post in this series. The accent-colored front band was a bit of a struggle. I had to rip the seam and start over at least twice – the first time for a wonky seam, and the second time because I realized the sew-in interfacing was just too heavy for the front band. I switched to an ultra-light fusible, on one of the facing folds, which gave me the amount of body I wanted. As for the back, have you tried side pleats instead of the center back pleat? I recently drafted a shirt with those, because they don’t add any width at the waist. I slashed from the top to the waist and squared to the side, before pivoting the amount of pleat take up. It worked well for the shirt I made. I had actually tried this idea out on the paper copy of the pattern, slashing and pivoting. What I realized was that the alteration made the side seam about 5/8 inch shorter, and that I would have to true that with the side seam on the front piece. Rather than solve that problem, I opted for instant gratification and went with the pattern I knew rather than edit the pattern one more time. I do plan to give this a go on a future shirt making project, just not this one. I’m pleased with the look of the two-tone collar. 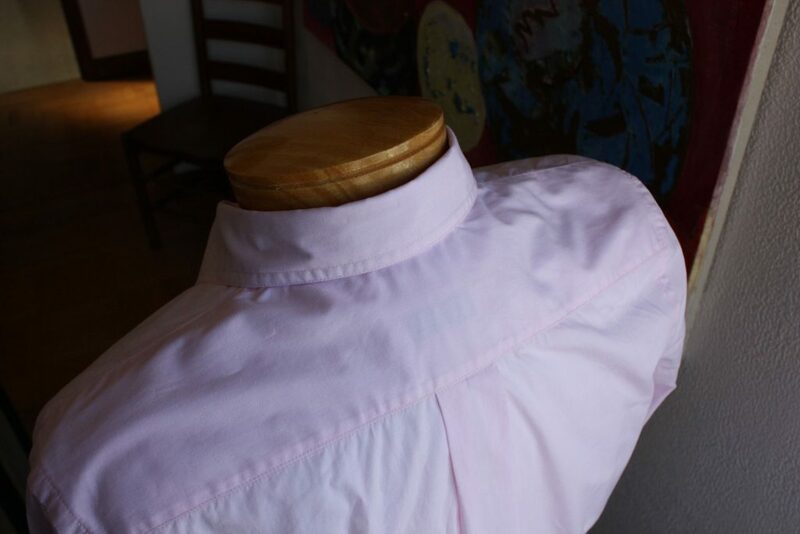 I do have a small issue when I button the collar; the collar blades overlap each other a short amount. I think the button is placed a little too far inward on the collar stand, but I haven’t tried it yet with a tie to see if that covers up the issue, or if I need to relocate the button. I’m only ever going to button the collar if I’m wearing it with a tie anyway. Wearing the collar open accentuates the “peek-a-boo” effect from the accent fabric. 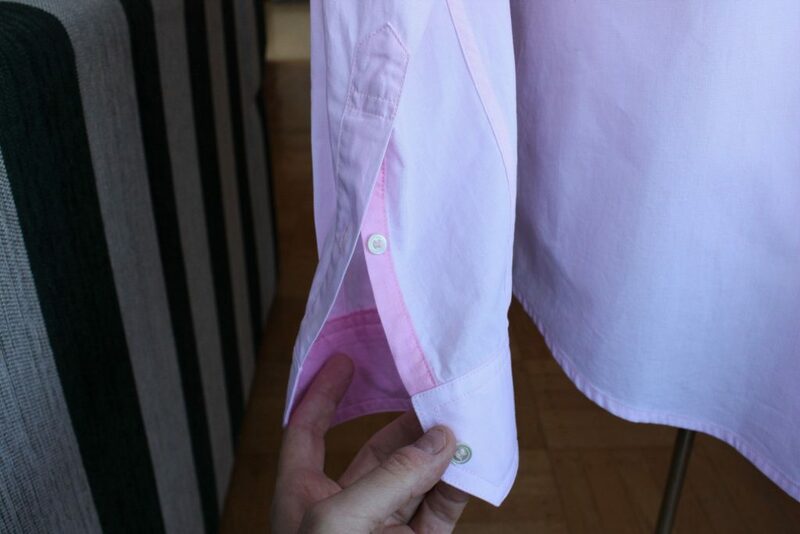 The cuffs have an accent placket underlap, and accent on the inside of the cuff. I obtained some smaller mother-of-pearl buttons from Wawak for the sleeve placket. This project wraps up my summer sewing projects. For the first time ever, I’m in sync with the seasons. I’m moving into autumn with two new projects I have in the works now; more on them soon. 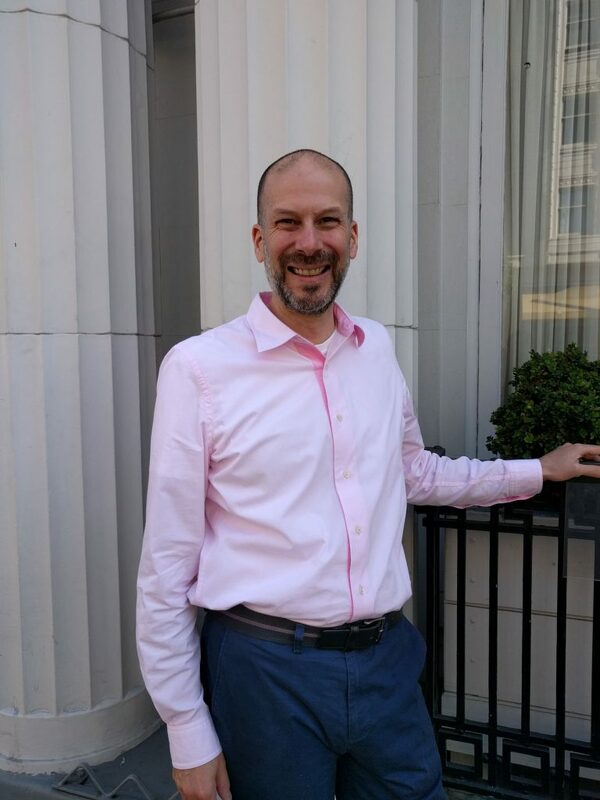 Impressed with your effort overall, and delighted with the use of Mother of Pearl (buttons get short-shrift in my opinion; your choice of Linda as a friend is a testament to your good taste in the company you keep). The “peek-a-boo” element is what more menswear needs (details, details, details!). The silent pleasure of linings and such have not been evenly distributed on a gender basis. Obviously your efforts are easily seen by watchful strangers as well as who ever does the laundry in your residence., but it also kicks open “the door of possibilities for menswear”, a little wider. Enjoyed your “summer series”, and looking forward to your “steamed apple cider with a cinnamon stick” efforts. I love it!! The shirt looks very professional and I agree re. the color: just the right amount of blue so that it brings out the natural pink in your skin but not too much. Great job on the contrasting details, especially the sleeve plackets. The fabric looks semi-sheer and I wonder what it would look like w/out an undershirt. How does the white t-shirt affect the color? I have to pay an online visit to Britex for some of that. Excellent work and I hope to see much more. That shirt fits you really naturally. You’ve done an excellent job tweaking the fit. And your very professional looking sewing job makes this an amazing shirt. Congrats! Love the contrasting darker pink. It makes the whole shirt. You must be thrilled with the result. Wow! Very nice job! Don’t be afraid to try those side pleats, that’s what I use on all my shirts. Thank you! I will definitely try side pleats on future projects. Very professional shirt! Great job! 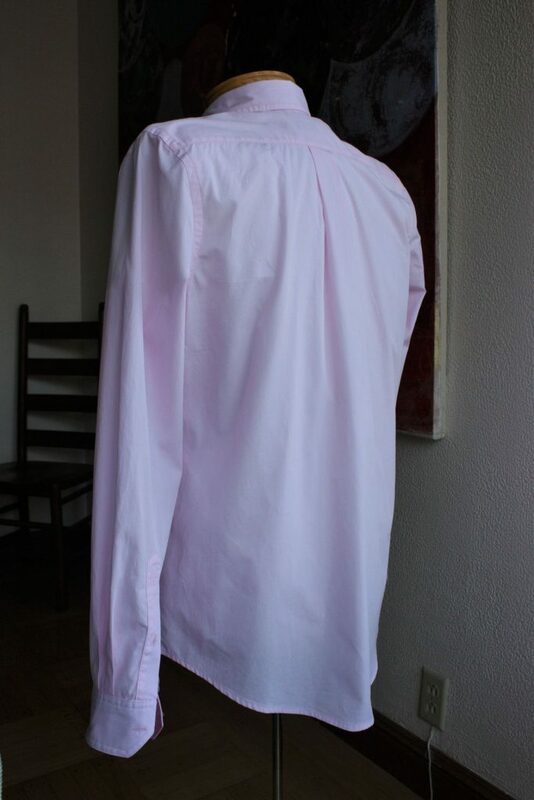 Just thought I’d add that yesterday I bought some pink lightweight poplin for a casual shirt; you’re not simply a fellow aspiring tailor, you’re a muse. I’m thrilled to hear that I can inspire others! 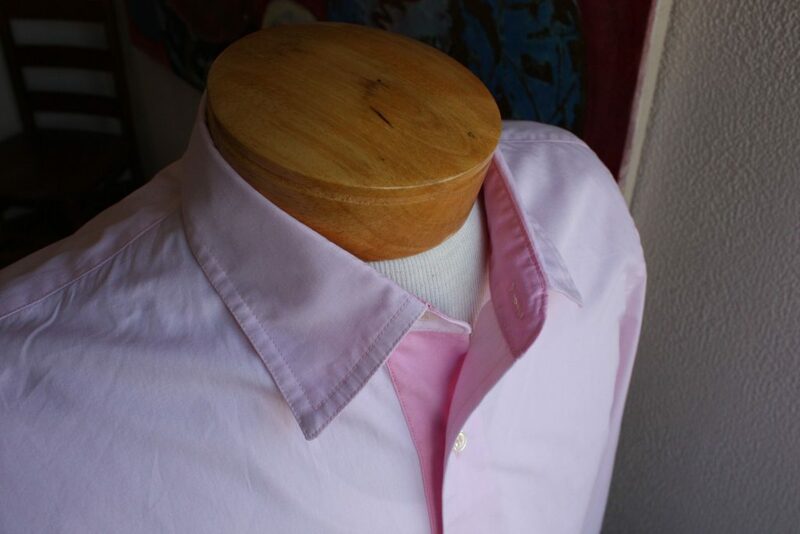 Hoping your pink poplin shirt is a knockout.